Swinging flies for winter steelhead isn’t for everyone. 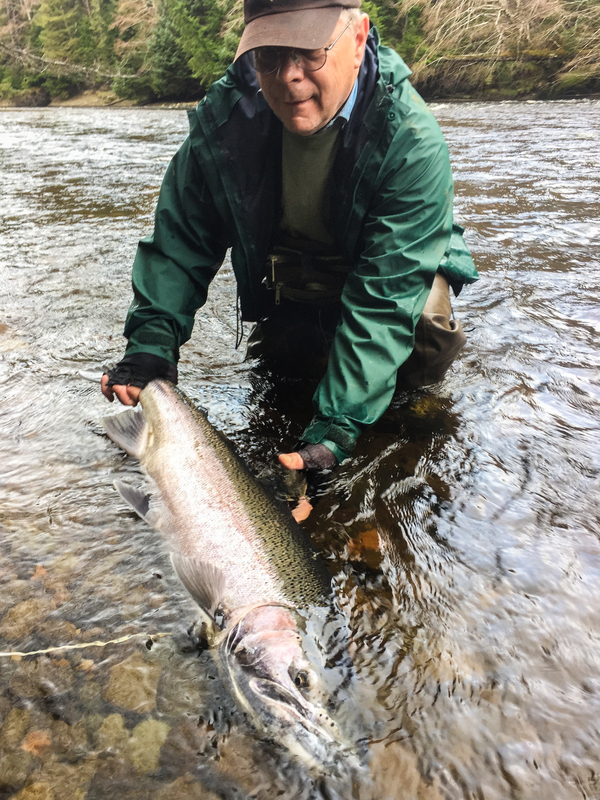 Fly-fishing for steelhead in general is a challenge, but for those who have the bug you'll want to add Haida Gwaii to your list. It's an incredible destination and regardless of the fishing this is an amazing place. Over the last thirty years we’ve been traveling where the clock is rolled back to a time and place that’s becoming hard to find, this is it. Simply stated the British Columbia islands of Haida Gwaii are a land before time. It’s small, but prolific steelhead rivers flow throw incredible dense forests of fir, hemlock and spruce that tower overhead as you drive, walk and fish the islands unique steelhead rivers.When we first fished these islands we didn’t put much thought into the fact that we were north of Vancouver fishing for steelhead in February and that it might be cold. We were just too excited to fish these waters. Although winter temps can be cool average daily temps are above freezing often in the 40’s and at times they can even be quite pleasant. That said, these islands get a lot of rain, and it’s those rains that keep a steady stream of winter run steelhead moving into their tannin stained rivers. So as nice as some of the winter days can be, some clouds and some rain are what you should be prepared for. These are also the best conditions for fishing. 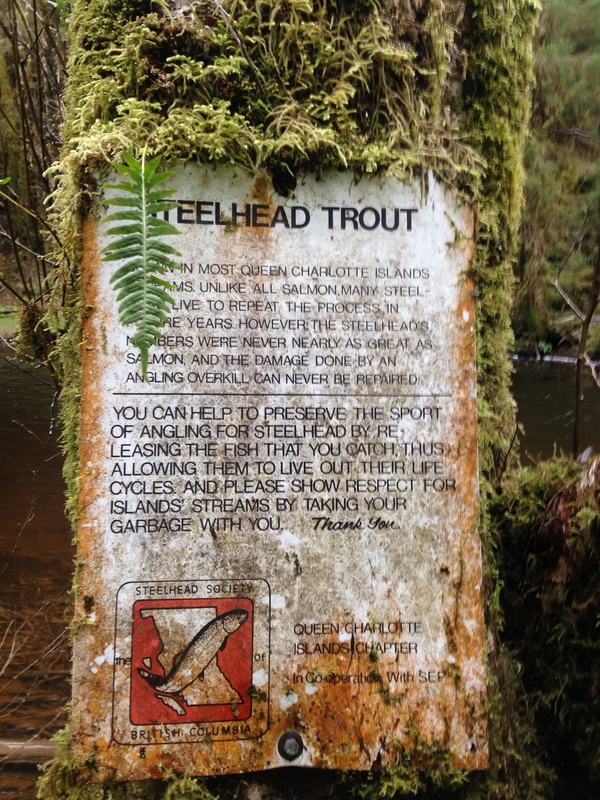 Although the islands rivers are quite small, they are home to some sizable steelhead. You'll experience very few other fishing if any. It's one of the endearing qualities of this beautiful place. When a steelhead comes across your fly, it's the first fly and probably the only fly they're going to see. Consequently, these fish are very aggressive to the fly and grabby. Something we rarely find on many of the more crowed northwest fisheries we fish each year. Your hosts, Frontier Farwest, operates some of the best, if not the best steelhead destinations in British Columbia. We’ve been working with them since the late 80’s. Their lodge, the Copper River Lodge is comfortably located on Morseby Island and it only accommodates four guest. It overlooks the infamous Hecate Strait and has you situated just a short drive from it’s most prolific fishery, the Copper River. It’s an incredible base camp, setting and a place by the time you leave you wish you’d spend more time at. Since the Copper River Lodge only accommodates four guest if your interested in visiting this unique destination we recommend you contact us we’ll in advance. The same goes for our hosted trip. These trips occur in late February. If you’re interested in joining us, give us a call, however similar to our September trip with Frontier Farwest on the Bulkley River these trips rarely have openings. Most of our guest continue to return each year, which speaks volumes about the fishing, the staff and overall experience you’ll have at this unique destination. If you’re interested in learning more about the Copper River Lodge, availability or want to get on a waiting list for one of our hosted trips, stop in or give us a call. Ask for Ken or Steve. They both have fished on Haida Gwaii and can help you plan a trip that will live up to your expectations.